Our test of nine moisturising creams found price doesn’t guarantee superior results. Even a $520 moisturiser failed to impress. Age-defying claims are stock-in-trade for the beauty business. Lotions and potions promising to “regenerate”, “rejuvenate” or “revitalise” your skin number in the thousands. More extravagant than the claims are the eye-watering costs of some of these products. But our test of nine moisturising creams found price doesn’t guarantee superior results. The moisturising efficacy of the creams was tested by corneometry. A corneometer is used to provide a measure of the skin’s hydration. Measurements were taken prior to and after use of the products over four weeks. Creams were applied twice daily. Products were blind tested by women aged between 25 and 66 years with a normal to dry skin type. Volunteers applied the moisturising cream to one forearm. The control product was applied to their other arm. Measurements were performed in humidity- and temperate-controlled conditions. In simple terms, skin can be categorised into several layers: subcutaneous tissue, the dermis, the epidermis and the surface layer called the stratum corneum. Skin cells are continually shed from the surface and replaced by new cells. However, as we get older, skin becomes drier and loses elasticity. Lifestyle factors such as smoking, and environmental exposure (cold, wind and sun) can exacerbate these processes. Sun exposure causes what dermatologists call “photo-aging”, damage attributable to sun’s harmful UV rays. Protecting your skin from the sun slows down the effects of photo-aging and minimises the risk of skin cancer. 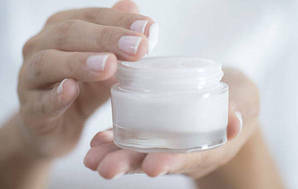 Regular use of a good moisturiser also helps hydrate your skin and slows moisture loss. But there’s little evidence of any other benefit.